Earlier called Row Green, its name comes from the Middle English wro,* meaning ‘a nook or corner; a retired or sheltered spot’. A large house stood here from as early as the 14th century and was joined by another around 1730. A hamlet of moderate size grew up around the green over the course of the 18th and 19th centuries. In 1835 the four Sidebottom brothers of Roe Green were drowned while bathing in the Welsh Harp reservoir when its dam burst. Kingsbury Manor, now in Roe Green Park, was built in 1899 for the Duchess of Sutherland. Since converted to offices, this Arts and Crafts house is grade II listed. During the First World War a housing estate was begun at Roe Green for workers at the nearby Aircraft Manufacturing Company. 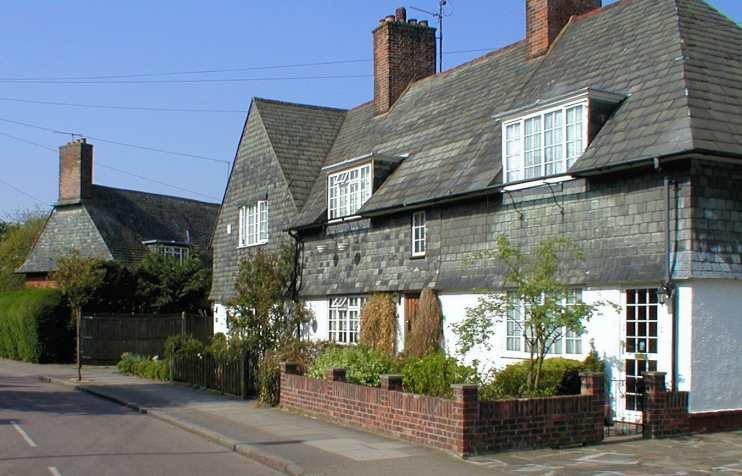 Commissioned by the Office of Works and built on garden suburb principles, the estate contained 250 houses and flats, an inn, six shops and a doctor’s house. It was designed by Frank Baines, who had earlier created the Well Hall estate for the workers of Woolwich Arsenal. Geoffrey Hewlett’s Kingsbury Through Time has an aerial photo­graph of the village in 1920, when it was surrounded by open fields on all sides. The rest of the area was built up during the late 1920s and the early 1930s. Roe Green school opened on Princes Avenue in February 1932. In September 1933 the school divided to become Roe Green infant school and Roe Green junior school. Later in the 30s the council bought land for the creation of the 42-acre Roe Green Park, which has a well-maintained walled garden that is managed by the Barnhill conser­vation group. The village was made a conser­vation area in 1968 and, unlike Kingsbury Green, retains a genuinely villagey aspect. In 1928 John Logie Baird received the first television pictures from the continent in a laboratory he had set up in the coach house of Kingsbury Manor. * Derived from the Old Norse wrá, this represents a rare appearance in the London area of a word brought by the Vikings. 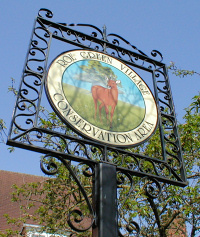 Despite the closeness, there’s no connection with the Old Norse rá, which is the ultimate origin of the English ‘roe’ – as in the deer (Capreolus capreolus) – so the cervine illustration on the village sign, as shown in the small photo, is purely artistic licence.